We made these ornaments at preschool to decorate for our holiday show this Friday night. When I brought in an example ornament the kids all exclaimed, "Cookie!" Which prompted a discussion about if it would be OK to eat our ornaments. Once I was sure the kids would refrain from taking a nibble, we started making our dough. As usual we sat in a circle on the floor to work together bringing all us right in to the activity. Put all your ingredients in a bowl starting with 1 cup of applesauce and mix it up. (We passed the bowl around our circle so everyone got a chance to stir and smell our creation up close.) You want the dough to be firm and a bit wet. It will be sticky but not so sticky that it is hard to work with. If it is too dry and crumbly, add more applesauce a little at a time. If it is too wet, add more cinnamon. Next dust a table with some cinnamon and then dump the dough out on the table. You can either roll it out or just pat it down until it is about a 1/4" thick or so, if you make it thinner than 1/4" your ornaments will be more likely to break. Trust me, I know! Let the kiddos help you pat it down if they want, they like this part. If your dough is cracking when you roll/pat it out then it is too dry so add a bit more applesauce. No need to put it back in the bowl, you can just mix it on the table. After you have your dough flatten out to a 1/4" or so, then it is time to cut shapes with cookie cutters. Let the kiddos cut out their shape and the use a straw to make a hole in the ornament for a string to go through. Using a spatula place the ornament on a cookie sheet or drying rack and let it dry for a few days. You can also place them in a 170 degree oven for a few hours to dry being careful to check them and turn them often so they don't burn. 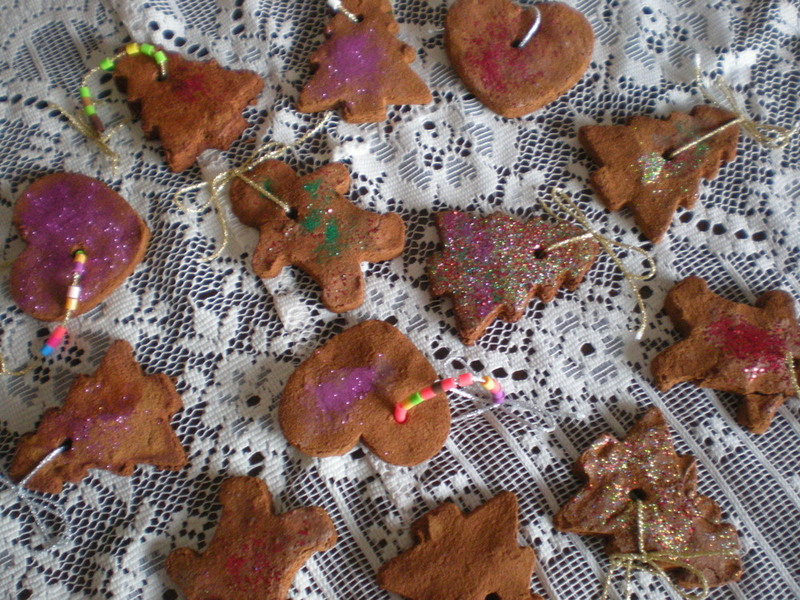 Once they are dry, they are ready to decorate or to simply hang with a pretty ribbon. cloves ~ can you shove them into the dough before it dries? We didn't use any of these at the school and I am excited going to experiment at home with my kids! We finally had time to play! Check out our herbie decorated ornaments! In some ways these couldn't be simpler to make but I must confess that I had a bad time trying to make these a few years ago when I started teaching at the preschool. 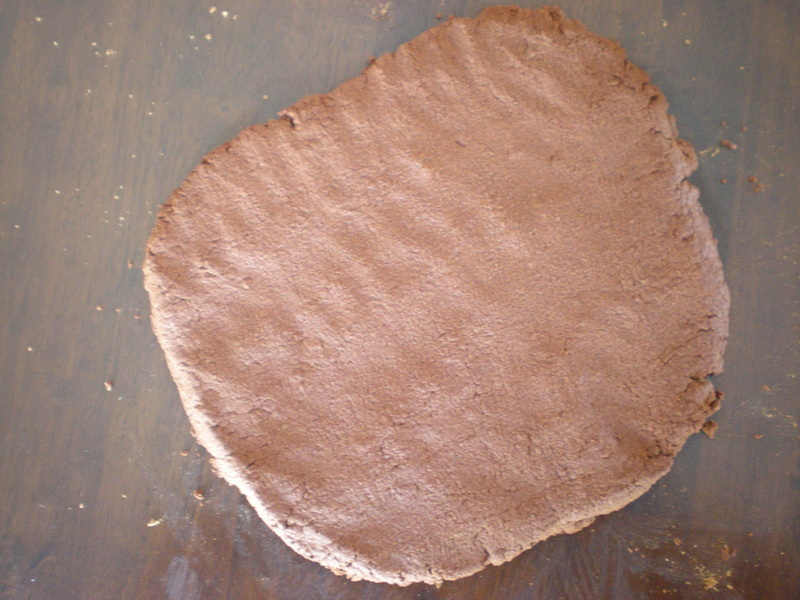 Here is what happened... After making a succesful test batch at home with my little girl, I went into the preschool all ready to have a fun day with the kids. Unfortunately, when we made our dough it was too sticky so we needed to add more cinnamon. Problem was, all the cinnamon was gone. So we added flour. Not a good idea. The dough became very sticky and all f the kids had their hands in it at the time. So there I was with eight freaked out little kids, hands covered in globby goop. Luckily the other teachers at the school helped out and we got everyone cleaned up in no time. Whew! So it was with a bit of trepidation that I made these this year at the school and I am so glad I did! Shared On: The Kid's Co-op, It's Playtime!